Situated within 7 km of Van Andel Arena and 7 km of Grand Valley State University - Pew Campus, Baymont by Wyndham Grand Rapids Near Downtown offers rooms with air conditioning and a private bathroom in Grand Rapids. The property is around 7 km from Gerald R. Ford Presidential Museum, 8 km from Devos Hall and 8 km from Grand Rapids Art Museum. The accommodation provides a 24-hour front desk as well as free WiFi. A continental breakfast can be enjoyed at the property. DeVos Place is 8 km from the hotel. 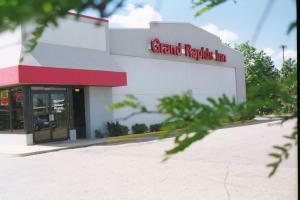 The nearest airport is Gerald R. Ford International Airport, 15 km from Baymont by Wyndham Grand Rapids Nea. When would you like to stay at Baymont by Wyndham Grand Rapids Near Downtown ? Each day we'll check prices and send you an email for your selected dates at Baymont by Wyndham Grand Rapids Near Downtown. If you don't have specific dates but would like to check prices for say next weekend or say next month we can check the price too. Click to write a review and share your experience of Baymont by Wyndham Grand Rapids Near Downtown with other travellers.